Burnley had sold Leighton James during the autumn of 1975 and as the season continued to falter as we headed towards relegation we finally got a replacement in Preston's young winger Tony Morley, although rumour had it that it was in bizarre circumstances. Ormskirk born Morley had signed for Preston as an apprentice and was offered professional terms on his 18th birthday in August 1972. He was in and out of the side for a while but eventually established himself as a first team regular. Such was his form that he was called up to play for the England Under-23 side, but he did only win one cap. Early in 1976 Preston accepted an offer from Arsenal and it looked as though he would be on his way to the first division at the age of 21. He was, but he never made it to Highbury. At the eleventh hour he pulled out of the deal, citing a wish to remain in his native Ormskirk with his family and friends. This alerted Burnley, and very quickly we stepped in and signed him for a reported £100,000 which was a club record. The signing was the first by new manager Joe Brown although there has always been speculation that Brown knew little about the move. Stories at the time suggested that Bob Lord, having seen Arsenal keen on him, spoke to Tom Finney about him. When Finney gave him glowing reports that was enough for Lord who quickly completed the deal. He certainly couldn't rescue Burnley's season and he failed to make any sort of impact as we were relegated. However, he was to make something of an impact with the chairman before the following season got underway. Morley's hair was somewhat long for a Burnley player and Lord suggested to him that it might not be a bad idea should he return with it shorter. He did, he shaved the lot off, and to make matters worse it displayed an earring which was something else the chairman was not over impressed with. Over the next three seasons, with the Clarets back in Division Two, he was in and out of the side. He was popular with the fans but was never able to find any consistent form and too often let himself down with some disappointing performances. First team coach at the time was Brian Miller and he once told me that Morley was a great Monday morning footballer, that there was nothing he couldn't do down at Gawthorpe training but just couldn't do it when it came to match day. It was something of a surprise in the summer of 1979 that Aston Villa came in for him and paid £200,000 to take him to Villa Park. His time at Burnley had without doubt been unfulfilled but he did leave us with one very special goal. That came at Easter 1979 when he scored the first in a 2-1 win at Ewood Park, a game which remains our last ever league win against our local rivals. By all accounts he was much the same at Aston Villa in his first season but then things took off for him. 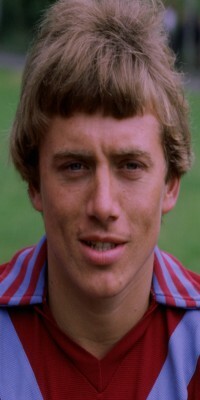 He became one of the star performers for Villa in the 1980/81 season when they won the League Championship. He was turning in top performances week after week for manager Ron Saunders. Perhaps the best remembered game that season was one at Everton when he scored a superb goal that won the Match of the Day Goal of the Season, and it also won a reader of this web site a prize of premium bonds for naming the goal as the best. A year later he provided the cross for Peter Withe to score the only goal of the game against Bayern Munich as they lifted the European Cup in Rotterdam, and by then he'd won a place in Ron Greenwood's England squad for the 1982 World Cup. Morley won six England caps but didn't feature in any of the World Cup games and that led to his career going into decline. He had just one more season at Villa where he lost his place to Mark Walters and in 1983 he moved to West Brom. Whilst there he went on loan to Birmingham, and I'm not sure too many players have played for all of Villa, Birmingham and West Brom. After two years at the Hawthorns he signed for Hong Kong club Seiko and then played for Den Haag in Holland before re-joining West Brom. It was during his second spell with West Brom that he returned to Turf Moor, joining Brian Miller's side on loan during the 1988/89 season. He played six games for us, five of them in the league, but he didn't look anything like the player he'd been. He did though turn in one superb performance in the Sherpa Van Trophy at York. His career was all but at an end. He went on to play for Tampa Bay Rowdies in America and Spartans of Malta before finally calling it a day. In more recent years he's often been seen playing in the Masters for Aston Villa but Tony Morley was a player who had enough talent to have gone further in his career than he did. He won a championship and the European Cup with Villa but his stay at the top was an all too brief one.